With a stay at Days Inn by Wyndham Cedar Falls- University Plaza in Cedar Falls, you'll be in a shopping district, within a 10-minute drive of UNI-Dome and College Square Mall. 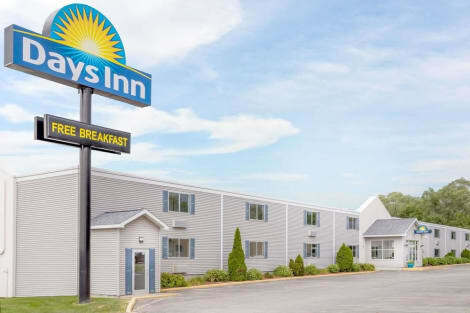 This hotel is 9.8 mi (15.7 km) from Lost Island Waterpark and 1.1 mi (1.8 km) from Falls Aquatic Center. 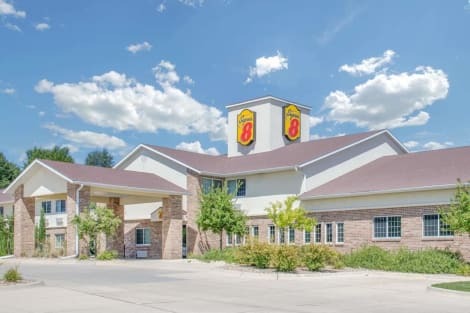 Located in Cedar Falls, Super 8 by Wyndham Cedar Falls is within a 15-minute drive of UNI-Dome and Lost Island Waterpark. This hotel is 3.4 mi (5.5 km) from Falls Aquatic Center and 3.9 mi (6.3 km) from Gallagher Bluedorn Performing Arts Center. When you stay at Suburban Extended Stay Hotel C in Cedar Falls, you'll be near the airport, within a 15-minute drive of UNI-Dome and Lost Island Waterpark. This hotel is 2.4 mi (3.9 km) from Falls Aquatic Center and 2.9 mi (4.7 km) from Gallagher Bluedorn Performing Arts Center. Located in Cedar Falls, Best Western Plus Technology Park Inn and Suites is within a 15-minute drive of UNI-Dome and Lost Island Waterpark. This hotel is 2.8 mi (4.5 km) from Gallagher Bluedorn Performing Arts Center and 2.9 mi (4.7 km) from McLeod Center. Make yourself at home in one of the 113 air-conditioned rooms featuring refrigerators and flat-screen televisions. Complimentary wired and wireless Internet access is available. Private bathrooms have complimentary toiletries and hair dryers. Conveniences include microwaves and coffee/tea makers, as well as phones with free local calls. Featured amenities include a 24-hour business center, express check-out, and complimentary newspapers in the lobby. Planning an event in Cedar Falls? This hotel has facilities measuring 8020 square feet (745 square meters), including a conference center. A roundtrip airport shuttle is complimentary during limited hours. lastminute.com has a fantastic range of hotels in Cedar Falls, with everything from cheap hotels to luxurious five star accommodation available. We like to live up to our last minute name so remember you can book any one of our excellent Cedar Falls hotels up until midnight and stay the same night.